The London 2012 Olympics run 16 days with 300 events spanning 26 sports. You would think that just the thrill of seeing someone cross a finish line or do a triple twist dismount would be more than enough to keep people talking. But the 30th Summer Olympics was a bigger topic of conversation thanks to all the controversies, especially those surrounding Asian teams. So with the tournament winding down, Asia Blog went ahead and took a look back at some of the biggest Asian scandals to hit the Olympics this time around. Eight women's doubles Olympic badminton players were disqualified for attempting to throw matches. Jung Kyung-eun, Kim Ha-na, Ha Jung-eun and Kim Min-jung of South Korea, Wang Xiaoli and Yu Yang of China, and Meiliana Jauhari and Greysia Polii of Indonesia were disqualified when their farcical serves and misses prompted booing from the stands. Yu Yang, who took home gold at the Beijing 2008, explained that she and Wang were injured before the match and that the disqualification "mercilessly shattered our dreams." The world champion bid her "beloved badminton" farewell forever following the incident. Since badminton debuted at the 1992 Barcelona Olympics, 24 gold medals have been awarded in the sport — and China has taken home roughly half of them. Despite the poor performance of the Chinese and Korean women's doubles teams, it seems that most of their athletes play to win; both countries are ranked in the top five, China with 36 gold medals and Korea 12. As Japan's Satoshi Shimizu knocked Azerbaijan's Magomed Abdulhamidov down six times throughout the Olympic Bantamweight Boxing match, which was virtually unheard of, the crowd expected Shimizu to be the clear winner. In a most controversial referee decision, Abdulhamidov was given the victory instead, with a score of 22-17. Rumors of match fixing arose as the BBC had presented evidence last September accusing Azerbaijan of paying $9.5 million in exchange for gold medals. The governing body behind Olympics boxing, the International Boxing Association (AIBA) found these accusations groundless. However, the Japanese subsequently won on appeal and the Turkmen referee was sent home following his controversial decision. US Swim Official Finds 16-Year-Old Chinese Olympian "Disturbing"
Sixteen-year-old Chinese swimmer Ye Shiwen apparently made "a lot of awful memories” come flooding back to American swim official John Leonard when she won gold in the 400-meter women's medley. Torpedoing the world record with a time of 4 minutes 28.43 seconds, Ye was also the youngest swimmer to compete in the medley. Suspicious of Ye's "superwoman" physique, Leonard called her performance "disturbing" and suggested that she might be "doping." Ye, who has never failed a drug test, credits her win to training five hours a day for nine years. Rather offended by Leonard's allegations, former Google China head Li Kaifu posted Leonard's home address on Weibo so his followers could give Leonard a piece of their minds. Li, who found Leonard's address on a public webpage, deleted his posts and apologized, but not before they were re-tweeted some 14,000 times. International Olympic Committee spokesman Mark Adams was less disturbed by Ye's swim, explaining, "these are the world's best athletes competing at the very highest level. We've seen all sorts of records broken already all over the place." A flag display in the heart of London's swanky West End caused controversy over the political status of Taiwan when Taiwan's national flag was replaced with one of Chinese Taipei, the flag under which the islanders compete in international sports competitions. Taiwanese government spokesperson Fan Chiang Tai-chi said, "the removal of the national flag has... hurt the feelings of Taiwan's people." Flash mobs and angry vlogs ensued. Madhura Nagendra befuddled Olympics spectators when she walked with the Indian delegates at London’s Olympics opening ceremony, and made the blood of many Indians boil hotter than Vindaloo curry. Dubbed "the woman in red" for the color of her top, Nagendra is a graduate student from Bangalore, India, who currently lives in London. Lord Coe, chair of the London 2012 Organizing Committee, confirmed Nagendra was a ceremony cast member who had been screened by officials and said that she probably got "slightly over-excited." Nagendra has since apologized. 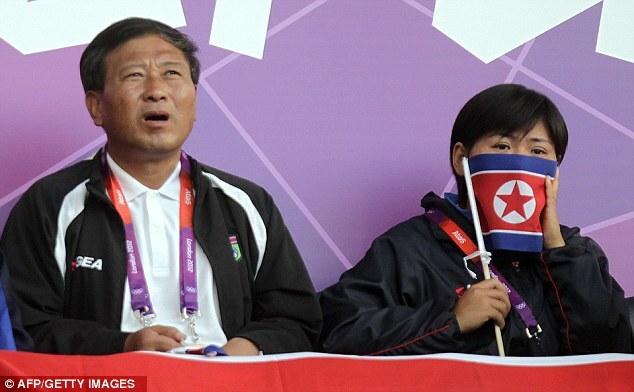 At North Korea’s opening women's soccer match on July 25, Olympic organizers mistakenly displayed the South Korean flag, much to the dismay, horror, and repugnance of the North Korean team. The team walked off the field in protest but eventually played Colombia more than an hour later. Olympic organizers apologized for their "embarrassing mistake" in the following days. Despite their differences, North and South Korea are both doing well in the Olympics. The DPRK is ranked 15th out of the 200 competing countries and has won four gold medals so far — the most since 1992's Barcelona games. The Republic of Korea's team, more than four times as large as the DPRK’s, isn't doing too badly either, laying claim to 12 gold medals and currently ranked 4th in the overall standings. Aarti Chawla, Bo Ruo Chen, Tahiat Mahboob, Shuan Sim and Sherley Wetherhold contributed to this story.